A Volkswagen Passat BlueMotion has set a new Guinness World Record for the longest distance travelled by a standard production passenger car on a single tank of fuel. The attempt, carried out by a team from The Sunday Times, involved driving from Maidstone in Kent to the south of France and back. 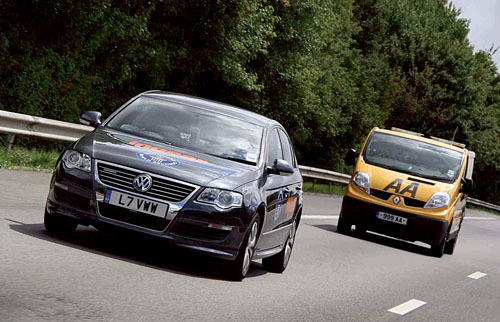 The Passat BlueMotion finally ran out of fuel close to Calais after completing a distance of 1,526.63 miles. The route mainly followed French autoroutes, but included some town driving, resulting in an average speed of just over 45ph. Gavin Conway, for The Sunday Times, drove the Passat BlueMotion during the three-day record-breaking trip, accompanied by a navigator and video crew. Two AA patrolmen followed the entire attempt in their van to witness the journey independently for the Guinness World Records organisation, which accredited the record. Powered by a Volkswagen 1.6-litre common rail TDI engine developing 105 PS, the Passat BlueMotion used for the record attempt was a standard production model. In common with the Polo and Golf BlueMotion models, the Passat is fitted with aerodynamic modifications to the bodywork, a lower ride height, stop/start, programmed battery charging, longer gearing, and low rolling resistance tyres. The result is a vehicle that is completely conventional to drive, service and maintain, yet among the most efficient vehicles on the road today. The Passat BlueMotion’s fuel tank was drained before the record breaking journey and filled with 77.25 litres of standard forecourt diesel, resulting in an overall fuel consumption of 89.83 miles per gallon. This substantially exceeds the Passat BlueMotion’s official combined figure of 64.2mpg. The resulting fuel cost for the journey works out at just 6.17p per mile travelled. In setting the record the Passat BlueMotion travelled a distance equivalent to driving from London to Malaga without needing to refuel, or from New York to Los Angeles with a single stop for diesel.